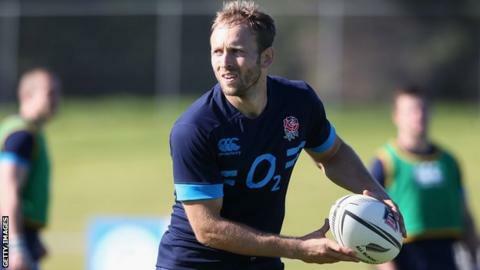 Worcester's Chris Pennell has been handed the chance to resume his England career after being named in the Saxons squad to play Ireland Wolfhounds. The 27-year-old full-back was told last summer that playing Championship rugby would not affect his England prospects. And, despite missing most of the first half of the season with a groin injury, Pennell has not been forgotten. "It's fantastic for Chris. It's a good opportunity for him to put his hand up again," said head coach Carl Hogg. "He was outstanding for us in the Premiership last year and quite rightly got his opportunity to go to New Zealand and win his first cap. After Worcester's in the British and Irish Cup quarter-final against Pontypridd on Saturday, Chris Pennell will join up with his England Saxons teammates next Monday at the Lensbury Club, near Twickenham, before flying to Cork. "We're trying to grow the next group of quality players who can thrive in the Premiership and ultimately go on to represent their countries." After winning his first England cap on tour against the All Blacks in Auckland last June, Pennell played in Worcester's first game back in the Championship. He was then sidelined for two months with the groin injury that ruled him out of contention for the autumn internationals. But, having returned to full fitness in a Worcester team who have now won 17 successive matches, he has earned a recall to the England set-up for the Saxons game in Cork on 30 January, one of the main curtain-raisers to the Six Nations Championship. The squad also includes Leicester flanker Tom Croft, Saracens lock Maro Itoje, captain of England's Under 20 Junior World Championship winning side last June, and Bath's Sam Burgess.